How does a perfect beach look like to you? White sand, crystal clear water, palm trees? Well, that’s what it looked like to me. 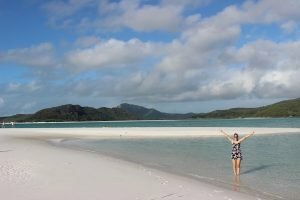 Now, after visiting Australia, the perfect beach looks like Whitehaven Beach. 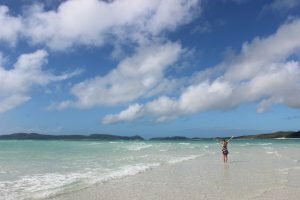 I’ve been to quite a few beaches on my travels and I loved many of them but there is this one beach that topped everything: Whitehaven Beach in Australia. This beach is part of the Whitsunday Islands, a group of islands close to Australia’s East Coast in the state of Queensland. 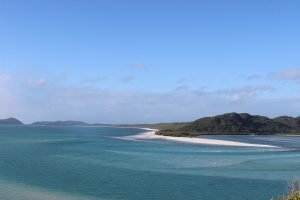 The group consists of 75 islands and on one of those islands you can find Whitehaven Beach. The sand is so incredibly white and soft that you can even wash your skin and hair with it. It sounds weird but believe me, this sand is better than every cosmetic item (the reason is the high percentage of quartz). 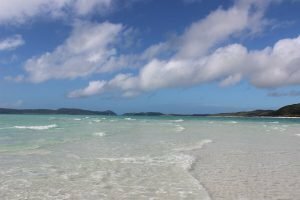 Although this beach was my personal highlight of the Whitsundays, there is much more to see and explore: beautiful nature, breathtaking coast lines and an amazing underwater world. There were so many colorful fish, corals and I even got to see turtles and a reef shark! This trip to the Whitsundays was just amazing and an experience I’ll never forget. 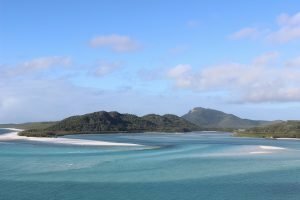 So how do you get to the Whitsundays and what’s the best way to explore the islands? Airlie Beach itself is not really big, but I still liked it. There are countless hostels, bars, restaurants and of course travel agencies. Literally, on every corner of this town you’ll find a travel agent trying to sell a tour to the Whitsundays. From day trips to tours that take weeks, from budget trips to luxury tours – you’ll find it all. The countless offers make it quite difficult to find out which company is good and which isn’t. So, I recommend to think about the budget first and then about what you want to do on your trip. Party all night long? Explore the islands? Relax? There is a company for all kind of interests. There are pure party boats, family boats, tours for nature lovers and so on. I’m sure you’ll find the perfect tour (if you’re not sure about a company, check out Trip Advisor, your travel guide or another platform; I used both and it really helped me with my decision). I decided to do a 3-days-sailing-trip with the company called Wings. There were mostly young people on board but although we had spent great evenings together as a group, the focus was on exploring the islands and not partying all night long. 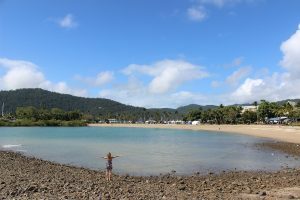 From Airlie Beach we took the sailing boat to the Whitsundays. The sailing boat was really great, there was heaps of space to relax and sunbath, a common room, bathrooms and of course sleeping areas. Our guides cooked every day fresh meals and I really have to say the food was absolutely delicious!! The guides were super friendly and tried their best to make this trip perfect for every one. The boat also had inflatable boats which got us to the best snorkeling spots. The marine life of the Whitsundays is just amazing! I’ve seen so many great fish, corals and even turtles and reef sharks. The underwater world is really breathtaking and absolutely beautiful! In the evenings, we watched the sunset and then the amazing night sky. As we were far away from civilization (and lights), we had the perfect view over the crystal clear sky. It was just amazing! I’ve never seen so many stars, shooting stars and planets before. Even the Milky Way was so clear that I couldn’t believe it. Just beautiful! Isn’t it just AMAZING?? I know, it’s my favorite word but there isn’t hardly another word to describe that place. By the way, I haven’t edited the photos, they’re all originals. I really have to say that Whitehaven Beach ist the most beautiful beach I’ve ever seen in my life so far. It just looks like paradise and yes, in reality it’s even greater. So if you’re in Australia one day, make sure to visit the Whitsundays. It’s one of the best things you can do in Australia and I’m sure you’ll love it as much as I did. Have you ever been to the Whitsundays? What did you like the most? I’m happy to read your comments.